Clemson Girl: Win an orange and purple dress from Twelve Saturdays! Win an orange and purple dress from Twelve Saturdays! Good morning Clemson Girls! We hope you had a wonderful Fourth of July! Today we have a fabulous giveaway from Twelve Saturdays - an online boutique specializing in gameday gear. 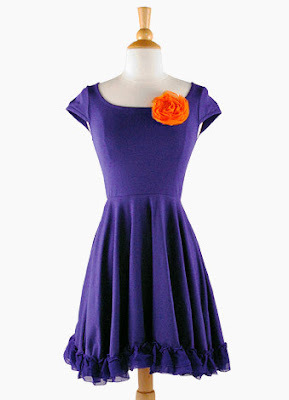 Check out this super cute purple dress with detachable orange rosette. This flirty dress is one of Twelve Saturday's best sellers because of its quality and versatility. This dress is as comfortable as it is flattering. The full circle skirt is accented with a double chiffon ruffle hem and the detachable chiffon and tulle rosette can be pinned on the bodice or at the waist. One very lucky Clemson Girl will win this dress in the size of their choice (XS, S, M, or L), a $49 value! Post a comment on this post with your first name, last initial, and where you are from (1 entry). 'Like' Twelve Saturdays on Facebook, then post "Clemson Girl sent me!" on the wall (1 entry). Share this giveaway on Facebook, then post another comment on this post letting us know you shared (1 entry). Follow Twelve Saturdays on Twitter, then tweet about this giveaway on Twitter...include a link to the giveaway and copy @twelvesaturdays and @clemsongirl (1 entry). Email a link to this giveaway to two friends and copy us at clemsongirlblog@gmail.com (1 entry). Deadline for entries is tonight, July 5, at 7:00PM EST. We will compile all of your entries, randomly draw a winner and announce the winner on the blog. The winner will have 48 hours after we post the winner's name to contact us to claim their prize or we will draw a new winner. Special thanks to Twelve Saturdays for reaching out to us and offering such a great giveaway to our readers! Make sure you visit their website so you can see all of the other great Clemson designs they sell. Absolutely love it and would love to show my Clemson pride back home in Colorado! I shared this giveaway on my Facebook page!